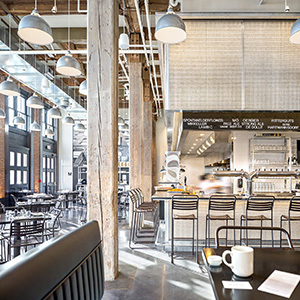 Craftsteak - Las Vegas | Bentel & Bentel Architects/Planners A.I.A. CRAFTSTEAK, LAS VEGAS, NV - Modeled on the New York restaurant from which it derives its name, Craftsteak presented the opportunity to bring the rich material palette and “craft” consciousness of its precursor to the surface world of the Las Vegas Casino. At almost twice the size of the original restaurant the feature of intimacy in the patron experience and private revelations it fostered were more difficult to deliver. To acquire more control we broke the space down into smaller areas divided both by function (bar, dining, private dining areas) and also spatially through the use of ceiling elements (lighting and soffits) and diverse wall treatments. In developing this project we noted a curious reversal of the relationship of our work to its surroundings. In New York City, real buildings and material circumstances of the public street were a counterpoint and challenge to the material authenticity of our intervention. In the casino the world “outside” the restaurant is materially uniform and ageless. Here the material richness of the space is enhanced by the physical circumstances of the casino outside. We were conscious that whereas the work in New York may appear “natural” in Las Vegas it possesses an unmistakable didacticism.